Wyoming native Joel Ostlind is a self-taught artist who spent much of his life herding cattle on horses throughout the American West. He holds degrees in Soil Science and Ranch Management, but this tall cowboy always carried a sketchbook to record his intimacy with the land in exquisite detail and authenticity. In 1990, he bid farewell to his cowboy days and moved with his wife and family to a home outside Big Horn, Wyoming. 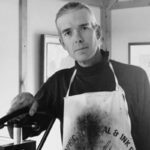 He signed up for a printmaking class at Sheridan College and built a home studio in the Big Horn Mountains. His drawings found new life as copper plate etchings depicting the full range of Western life, from Native American lodges to contemporary fly fishermen, telemark skiers and horses grazing under Wyoming skies. Although Joel is also a painter, he considers himself first and foremost an etcher. His style has been compared to Rembrandt’s, emphasizing expressive draftsmanship. The pencil drawings of those sketchbook days are the foundation of all of Joel’s artworks, just as Rembrandt used sketches to plan his canvases. Joel’s work has been featured in galleries, museums and exhibitions across the US. His prints were exhibited in a 2004 retrospective, Copper & Canvas: The Prints and Paintings of Joel Ostlind, at Bradford Brinton Museum in Big Horn, WY. He was the featured artist at the 2002 Coors Western Art Exhibit and Sale, and the subject of a 2005 article in Southwest Art magazine. Joel’s work has also been featured in the 2016, 2015, 2014 and 2013 Coors Western Art Exhibit and Sale.